Pay and productivity growth over the past couple of years have remained weak despite a rapid fall in unemployment and robust GDP growth. But these aggregate measures in the UK reflect the sum of a diverse range of individuals in the workforce. Changes in the mix of that workforce, therefore, can affect pay and productivity growth. Based on analysis of the determinants of individual workers’ wages, I estimate that changes in the mix of the workforce may account for about 1pp of the recent weakness in annual average pay growth relative to normal. All the variables included in the regression were statistically significant and coefficients are in line with economic theory. For example, there is a typical hump-shaped profile for pay by age, reflecting the returns from increased experience, with 35-49 year olds earn around 35-40% more than 16-19 year olds). Similarly wages increase the longer that someone is employed, particularly over the first few years. Using these results, I estimated the fitted wage for all employees surveyed in the LFS and calculated the contribution of each characteristic to the average fitted wage. I could then infer the contribution of changes in the mix of the characteristics to the level of pay and pay growth. Over the period 1995-2014, compositional effects pushed up on the average level of pay in the economy by about ½pp a year. Since my original work on compositional effects, the Resolution Foundation has produced similar estimates of the effect of changes in the composition of the workforce. This mainly reflected rising qualification levels and a shift towards higher skilled occupations. These long-run trends are likely account for some of the trend increase in pay and productivity growth, so to explain how changes in the composition of the workforce explain weakness in pay relative to past trends, the compositional effects were mean-adjusted (Chart 1 – an update of the chart shown in the May Inflation Report). 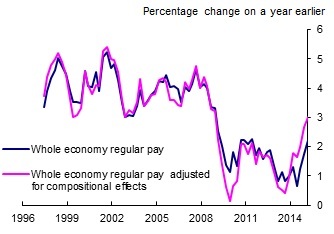 Between mid-2008 and mid-2013 compositional effects pushed up on annual pay growth by around 0.4pp more than normal. 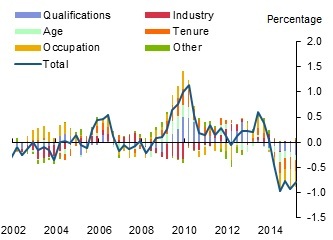 This reflected a cyclical increase in the average qualification and tenure of the workforce during the recession, as lower skilled workers were more likely to lose their job, and firms generally cut back on hiring. Over the past year, composition effects are estimated to have pulled down on annual wage growth by almost 1pp relative to normal. My interpretation of this is that, as the economy has started to recover from the recession, the cyclical boost to pay from changes in the mix of the workforce that occurred after the recession has started to unwind. The cumulative effect of compositional effects since the end of 2007 remains greater than normal, which I think suggests some scope for continued drag (Chart 2), although the scale and persistence of the drag will depend on whether there are structural factors that explain some of the change in the composition of the workforce. If you subtract the contribution of compositional effects from headline average weekly earnings growth, then the adjusted measure of pay growth was slightly weaker than the headline measure throughout much of the past five years. But the current drag from compositional effects means that adjusting the ONS data on average weekly earnings for compositional effects suggests annual regular pay growth of around 3% (Chart 3). To the extent that wages are an indicator of workers’ productivity, then compositional effects may also explain some of the recent weakness in observed productivity. I’ve assumed that labour productivity growth is affected by the same amount as employee pay growth; this suggests that productivity growth may have picked up from around zero in mid-2013 to around 1½% in 2015Q. But the cyclical boost to productivity in 2009/10 (Chart 2) means that changes in the composition of the workforce cannot explain any of the puzzling weakness in productivity since 2007 – if anything they increase the puzzle as compositional effects have been pushing up relative to normal. My calculations also only estimate the mechanical impact of changes in the composition of the workforce; it doesn’t explain why the composition has changed. If these changes reflect broader factors in the economy that affect productivity as well, such as those outlined in recent bank work, my estimates may partly capture some of those existing explanations for the weakness in productivity. The remaining unwind of the cyclical change in the workforce is likely to drag on pay and productivity growth in the near term. Unless the mix of the workforce continues to change then the effects on pay growth will be temporary. Chart 2 suggests there is still some cyclical boost to unwind, particularly as the mix of qualifications and tenure across the workforce returns to normal. 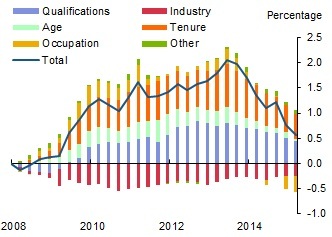 After a sharp fall in the number of people who had been in their role for less than a couple of years during the recession, reflecting lower hiring, the proportion of people who are relatively new in their jobs has picked up over the past year or so contributing to the drag on average wage growth. I think this trend is likely to continue as hiring continues to pick up and more people start moving between jobs again. But as the tenure mix of the workforce returns to normal, the drag on average pay growth will wane. Similarly, I expect the drag from qualifications to continue for a period as those lower-skilled workers who lost their job in the recession come back into the workforce. This will temporarily slow the trend pickup in the proportion of workers with degrees in the workforce. The average level of pay and productivity in the UK reflects, in part, the characteristics of the workforce and the type of jobs they are doing. My calculations suggest that changes in the mix of the workforce can help explain about 1pp of the weakness in annual average pay over the past year or so. If you assume labour productivity growth is affected by the same amount as pay growth, then changes in the mix of the workforce can also explain some of the recent weakness in productivity growth. In the near-term I expect that this drag on pay growth is likely to continue but these effects should fade as the labour market returns to normal. Author: Matthew Corder works in the Bank’s Structural Economic Analysis Division.